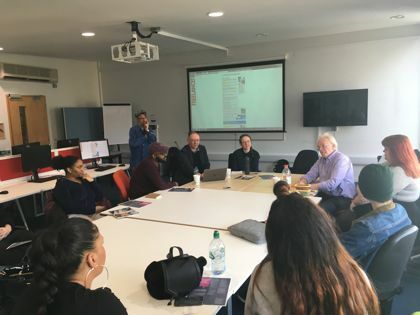 LONDON Freelance Branch's team reaching out to the capital's journalism students has been active, with two events on consecutive days in March - one at the University of Roehampton in Richmond and the other at the University of East London in Docklands. 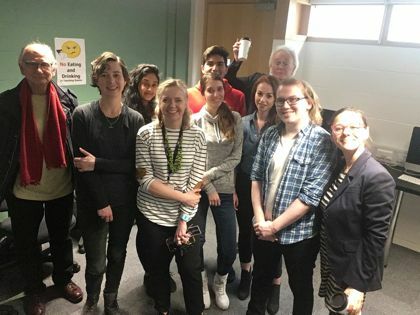 Roehampton journalism students with Francesca Marchese (right), Larry Herman (left), Fiona Swarbick (to Larry's left) and Phil Sutcliffe (back right, raising coffee cup). 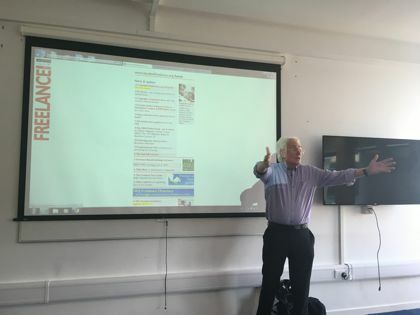 The LFB team visiting the University of Roehampton's Journalism Department included Phil Sutcliffe, Larry Herman and me. Fiona Swarbrick, NUJ National Organiser for magazines, books, PR and communications was present as well. 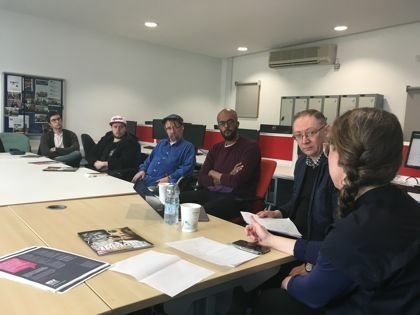 She discussed the most significant characteristics of her sector, and in particular the topic of which magazine journalists are doing well in London. We were invited by the senior lecturer Alison McClintock and we met a group of students in magazine journalism (more than in the photo). They are working on a project which is magazine for international students in London, and they asked us for tips and advice. Also, they wanted to know my experience as Italian expatriate in the UK. Finally, we discussed rates, invoicing, tax, negotiating and so on. Phil adds that "while Francesca was out making a video with the international students' magazine group, Larry and I talked with other students about copyright, protecting it and how the NUJ can help you get paid if you have your work nicked... Inspiring young minds, and the students were quite lively too!". 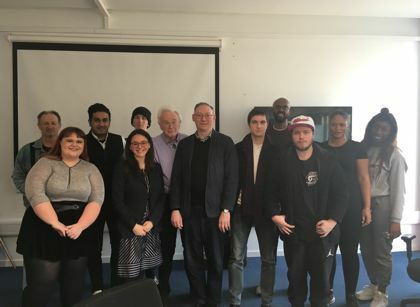 The following day, we met 10 students on the Journalism course at the University of East London, plus Jonathan Hardy (professor of Media and Communications) and Andrew Calcutt (principal lecturer in Journalism). Sarah Kavanagh - the NUJ's Senior Campaigns and Communications Officer delivered a speech about the activities of the NUJ. For LFB, Phil Sutcliffe and I spoke about the importance of negotiation and about rates. Thanks to LFB Training Officer Tim Gopsill for making this connection with UEL. Jonathan Hardy said, "All the contributions were fantastic and perfectly pitched. It was very useful and insightful to get into richer dialogue with students, who certainly responded well. I am sure that will have added to the impact and influence on students. We would certainly like to build on this and run another event next academic year". Andrew Calcutt added, "It was great to have the LFB here to personify both the benefits and the virtues of mutual support in the 21st century".